In 1993, Nigerian opposition leader Moshood Abiola declared himself winner of a presidential election he had generally been presumed to have won. The elections were annulled by the military and Chief Abiola, considered one of the richest men in Africa, was subsequently jailed in 1994 for the declaration. He died in prison four years later and although a team of international doctors found that he died of natural causes, to date there is belief he paid the ultimate price for his decision. Abiola was very popular and he could have, with the backing of the masses, prevailed as Nigeria’s leader had the military not had an upper hand in Nigeria’s politics. First forward, 25 years later, and popular politicians like Abiola faced with what they call political injustices as a result of Africa’s ritualistic “unfair” elections are rekindling his move, only taking it a notch higher. Back home, in East Africa, two opposition leaders—Dr Kizza Besigye and Kenya’s Raila Odinga—have not only made declarations that they won Uganda’s and Kenya’s disputed elections respectively but have gone ahead to take the oath of office to lead “people’s governments”. It is an undisputed fact that both have millions of followers even if one was to take the number of votes allocated to them by electoral bodies in either countries. The phenomenon of “people’s president” can perhaps be traced back to Andrew Jackson the seventh US president who ruled from 1829 to 1837. He was known for representing the rights of the common man so much that in an unprecedented move, people trekked miles and camped for days just to see him on his inauguration day, something that would cause a stampede. APJ Abdul Kalam, the 11th president of India (2002 to 2007), is another leader who was fondly called the “people’s president” for his ability to connect with the people of India and inspiring the youth into joining politics. In the aftermath of her defeat by Donald Trump, there were many suggestions of referring to Hillary Clinton as the “people’s president” but this did not amount to much in terms of action. Ms Clinton won the popular vote by a margin of more than 2.9 million, the largest, but Mr Trump took the day with his Electoral College win. The oath Days to Mr Museveni’s re-inauguration as president, Dr Besigye, who maintains he won the controversial 2016 elections, released a shaky video, holding a Bible and being sworn by an unidentified person as president. Dr Besigye’s “secret” oath was taken hours before Mr Museveni was sworn in for a fifth elective term. He was, subsequently, arrested and detained before being charged with, among other things, the capital offence of treason. Dr Besigye has said he is guilty of the 2016 charges and has dared government to take the case to trial. But, more than a year since he announced his defiance and vowed not to return for either his bail extension or case hearing, government has not moved to prosecute the case. The acronym of “people’s president” on the four-time presidential candidate has always been there given his ability to woo and charm the masses with messages of hope in a post-Museveni era but the idea of that morphing into a “people’s government” could have been encouraged by the overwhelming commitment of the people to donate and turn up to what he said was their cause as he campaigned for the 2016 polls. Peasants with as little as Shs100 would push into his hands while others donated foodstuffs and livestock. Already, the Besigye-led people’s government has been to different parts of the country donating relief food items but with no or limited resources given that they don’t collect taxes and the persecution from those in power, the people’s government can but have much impact. We were unable to get answers on how the “people’s government” is likely to work in the long term and what it seeks to achieve and fulfil. We put that and more questions to Dr Besigye but we were yet to get answers by press time. In Kenya, the import of the people’s government and a people’s president can be found in recent happenings including in opposition leader Raila Odinga’s inauguration speech on Tuesday after he was ‘sworn in’. Odinga’s oath before thousands of supporters who had gathered in Nairobi’s Uhuru Park came three months after Mr Odinga boycotted a presidential election re-run. Mr Odinga had, successfully, petitioned the country’s Supreme Court to annul last year’s August presidential election result saying the electoral commission committed “irregularities and illegalities” during the vote, harming the integrity of the election. On the other hand, Dr Besigye who had challenged Mr Museveni’s victory thrice—twice in court and once on the streets during walk-to-work— was not allowed to leave his house in the aftermath of the polls. 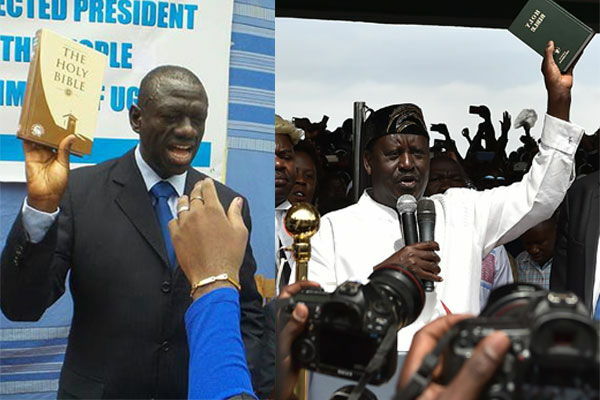 Both Odinga, 73 and Dr Besigye, 61, seem to be boxed in a corner despite having been in the trenches in their quest to lead the “liberation” of their respective countries. A son of Kenya’s first vice-president, Jaramogi Oginga Odinga, Raila endured the wrath of president arap Moi’s dictatorship, especially after the 1982 coup attempt. For that, he holds the record for being Kenya’s longest-serving detainee. Few political detainees, if any, can challenge Dr Besigye to the “most imprisoned” person award. By November 2015, he had been arrested 43 times in five years. In 2016, immediately before and shortly after the elections, he was arrested four times in a space of only eight days. Mr Odinga’s first attempt at the presidency was in 1997. He opted out of the presidential race in 2002, backing Mwai Kibaki in a historic election that saw the Kanu party lose power for the first time since independence in 1963. When he was not announced winner in 2007, an election that he is widely believed to have won, the post-election period deteriorated into countrywide violence, leaving at least 1,300 people dead and more than 600,000 displaced. For Dr Besigye, he was in the bush with his now political nemesis, Mr Yoweri Museveni. He has, unsuccessfully, run against the incumbent in the disputed polls in 2001, 2006, 2011 and 2016. So, what could be pushing the two leaders and others yet to take similar decisions to form what seem like parallel sitting governments? And, why are the governments with “real” power unsettled with these “people’s government”. “The so called people’s governments are an illegality being set up by bad election losers who refuse to accept defeat,” says Col (rtd) Shaban Bantariza the deputy executive director of the Uganda Media Centre. On the surface, the formation of “people’s governments” and swearing in of “people’s presidents” looks like a desperate attempt by the two leaders to gain power that they have either been denied or have failed to win. Dr Besigye has previously argued that Ugandans are “powerless” with real power concentrated in a cabal of a few individuals and this has more or less been the same since independence with the masses ideally supposed to be masters turned into servants and vice versa. In 2016, for example, he was put under house immediately after the 2016 polls and this he says denied him an opportunity to exercise his right to either challenge the outcome of the polls in the courts or not. Police also raided the opposition Forum for Democratic Change (FDC) tally centre and laid siege on the party headquarters including arresting and detaining many other leaders and supporters in the opposition. Challenging the elections was left to the fringe candidates but also under much difficulty. Also, in anticipation of a mass uprising, police and the military were heavily deployed in the major towns across the country. Intimidation, arrests and kidnaps were reported. While he successfully challenged the August 8 election results, Mr Odinga faced stumbling blocks as he pushed for reforms ahead of the repeat elections. The ruling Jubilee Party used its majority in Kenya’s parliament in the lead up to this repeat poll to pass amendments to sections of the electoral laws in favour of the incumbency. A commissioner for Kenya’s electoral body, Roselyn Akombe, fled the country a week to the repeat election citing “political interference in the body’s work that had rendered the electoral body so dysfunctional that any hope of the commission carrying out credible elections that had been scheduled was non-existent”. A top official of the commission, Chris Msando, had been brutally killed in the days leading up to the August 8 polls. Mr Odinga, perhaps, has more resources and commands a more united and stronger opposition force than any opposition politician in East Africa but the political environment on the continent has shifted from what it was in 1982 when his first major presence on the political scene was registered. Mr Odinga played a role in the 1982 failed coup against president arap Moi but it would be untenable today even if he and his supporters had the resources and capacity to pull off one. A similar situation prevails in Uganda and on much of the African continent. Coups and armed struggles, once a common means of changing government in Africa after a credible election process failed have almost become unfashionable. Recently, when Zimbabwe’s military moved to depose long serving president Robert Mugabe, the generals in charge had to labour so much to successfully sell what had happened as anything but a coup. Popular uprisings would be another course of action but as it has been demonstrated in Uganda, Cameroon, DRC, Togo and many other countries, the incumbents can effectively deploy state resources to crash these with a message “don’t ever try it again” behind. For the right reasons, many people dare no more. The events after the Arab Spring particularly in Egypt are also uninspiring. Unless when their interests are threatened or when on a balance of probability the same interests can be protected by the order that wants to take over, foreign powers have demonstrated that they can look the other side when political, electoral and other forms of injustice are being committed in countries such as Uganda and Kenya. In Kenya, for example, powerful observer missions accredited to the country from the European Union, the United States and other African countries gave the August 8 election a clean bill of health, even as Mr Odinga protested about the transmission and tallying of results, saying the system was hacked. When the verdict of the historic ruling by the Supreme Court of Kenya that overturned the same election was announced, questions were asked about the credibility of the observers who had cleared the same elections. Author Helen C. Epstein’s latest book Another Fine Mess: America, Uganda and the War on Terror. captures the relationship best. “In exchange for billions of dollars in economic and military aid, as well as powerful diplomatic support, Museveni has served as our proxy warrior, sending his troops around the region to weaken or topple other governments, particularly Islamic ones”. “In return for a handful of military favors,” she says.